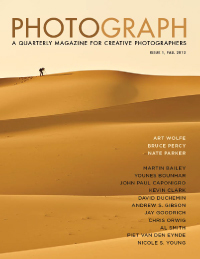 “Photograph” – yet another photography magazine? I wasn’t planning on writing this review. However, the set-up containing all my images and doubling as a back-up for all computers in my house is under maintenance. In result, I cannot do anything on blog other then this review. And it might be a while. I went ahead and downloaded “Photograph”, the first issue of the quarterly magazine from Craft & Vision. Don’t get me wrong. I really liked “Photograph”. The editorial choices for content are just right. More then half of the magazine are portfolios- including one of Art Wolfe, to throw some names. The rest is a great mix of technique, craft and inspiration. You will find there portrait lighting from Kevin Clark and combination of lighting and post-processing tips from Piet Van Den Eynde. There is my favorite article on dissecting the composition by John Paul Caponigro. And lastly, the story telling by Jay Goodrich made me want to get on an airplane and take some aerial of the area right now. Yet, something just doesn’t sit well with me. Continue reading and share your thoughts on the subject. I don’t think magazines are needed anymore. When I look for photography-related articles, I go to aggregate websites, like DP Review, Digital Photography School or Faded & Blurred. I follow blogs of my favorite photographers, like William Neill or Guy Tal. To find inspiration, there are sites like 500px. So what is the advantage of the photography magazine? I can understand more one-type photography oriented like Nature Photographer or “Outdoor Photographer”, for example, but I am sometimes having hard time justifying the price pf purchasing a magazines. It has random content curated by somebody for me. Some sections will interest me more while I would just go past the others. It makes more sense to get one of many reasonably priced e-books on a single subject of interest to me at the given time. Yet, new photography magazines are showing up all the time. From the circles I follow, just recently there is “Photograph”, “Rear Curtain” and Aksgar… It almost makes you wonder, if there is something in the editing the magazines that people decide to create them, not really considering if there is going to be enough interest to sell them to the audience! And then, the editora need to make another hard choice. It also affects the success of the magazine, as far as I can tell. “Photograph” will be available only as digital download. This I actually think is a good idea. There are few new magazines, for example “Rear Curtain”, which do not offer any electronic version at all. I do understand that there are still people who need to have a paper book in their hands. Well, there are also people who are still shooting film cameras or have stationary phone at home. Nothing wrong with that. It is just not for me. Availability of the product in the compact, electronic way is very important. Even regular books I buy only on Kindle, and have moved all my magazine subscriptions onto iPad. That’s who I am, and only partially it is related that I already made moves across The Pond few times in my life. So as much as I support the digital only version, I believe it is going to cost them some more traditional readers, which seem to be the best audience for the content. After all, we do look at the photography far too much on the screen and not often enough make any prints. It is kind of ironic, that “Photograph” will not have a hard-copy version, with David DuChemin advocating and practicing printing and tips on color management and printing from Martin Bailey in the first issue. It’s like missing on possibility to really showcase those amazing images on good quality paper. All in all, I was surprised to see “Photograph” being announced. What am I missing here? Anybody has any arguments for making more photography magazines, digital or otehrwise? One Response to "“Photograph” – yet another photography magazine?"